Pennington County Water Rescue search a small creek Sunday after a dog showed interest. RAPID CITY, S.D. 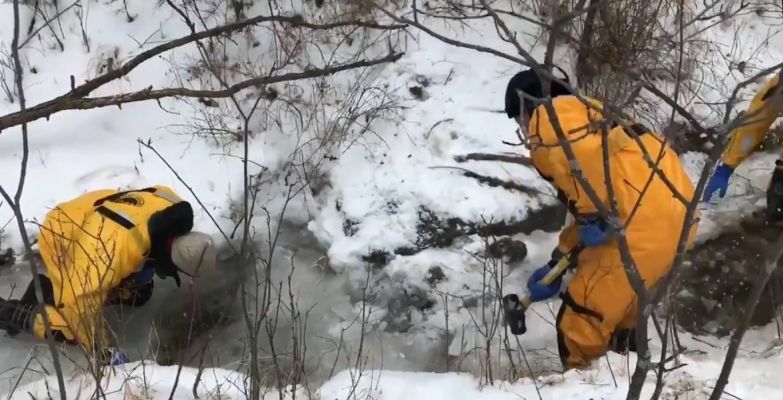 - A weekend that began with hope ended with sorrow Sunday, as search and rescue crews wrapped up an unsuccessful search for missing 9-year-old Serenity Dennard. It has been a week since Serenity ran from the Black Hills Children's Home near Rockerville. There has been no trace of her since. Seven dog teams and a helicopter joined in the weekend search. The dog teams were from several surrounding states and the helicopter was donated to the search by Mike Jacobs and his Rushmore Helicopter business of Keystone. Pennington County Deputy Sheriff Willie Whelchel says it's been an emotional weekend. "Everybody that's been involved, that's been out searching, obviously it becomes personal. It's an emotional thing. The longer it goes on it gets harder and harder. Everyone wants to bring Serenity home. If she is up in the woods we want to find her and bring closure to all this." Whelchel says they did bring in the Pennington County Water Rescue Team after a dog showed interest in certain areas long a small creek. Nothing was reported found. Whelchel says they hope and pray some better weather arrives soon as the out state dog teams prepare to head home. "We had some dogs with some cuts on their pads and their feet, and you know, they are just wore out and tired. They covered a lot of ground but the terrain has been really hard on the dogs, especially today." Whelchel says crews really need to some warmer weather to diminish some of the snow cover. He says they will regroup on Monday to decide what's next and what direction they would go.